Communities all over Santa Barbara County are planning events during the month of December to celebrate the holiday season. Parades and festivals are on the way, starting this weekend. 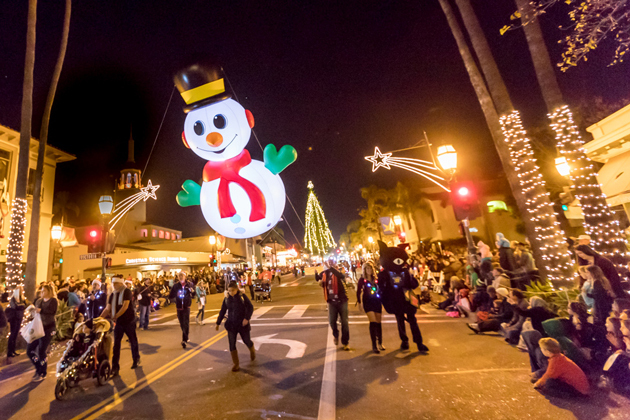 The 65th Annual Downtown Santa Barbara Holiday Parade will light up Santa Barbara’s State Street at 6:30 p.m. Friday. The parade, presented by Consumer Fire Products, Inc., travels down State Street from Sola Street to Cota Street and will feature giant balloons, marching bands, floats, performance groups, the holiday prince and fairy, and an appearance by Santa Claus. The holiday prince and fairy will lead the march and light the community Christmas tree, kicking off the start of the parade. Event organizers expect more than 65,000 spectators to line State Street. The Goleta Old Town Association is hosting its second annual Old Town Christmas Parade at 6 p.m. on Dec. 9. The parade route is on Hollister Avenue between Orange Avenue and the Goleta Valley Community Center. This year’s Grand Marshal is Jean Blois, former Goleta mayor and city councilwoman who has also served on the Goleta Union School District and Goleta Water District. There will be a Christmas tree lighting in front of the Goleta Valley Community Center after the parade, and attendees can also take pictures with Santa Claus. In Carpinteria, fun-filled community spirit will take place during the holiday parade at 3 p.m. on Dec. 9. The parade will start at 9th Street, turn left on Linden Avenue, continue up Linden Avenue, make a U-turn at the corner of Linden and Carpinteria avenues, and turn on 6th Street to end at Parking Lot #1. The Milpas Community Association parade is set for 5 p.m. on Dec. 10, featuring children’s groups, live performances and classic cars on the route from Canon Perdido Street south to Mason Street. The 32nd Annual Parade of Lights will take place at 5:30 p.m. on Dec. 10 at the Santa Barbara Harbor. About 30 illuminated and decorated vessels will cruise through the harbor and past Stearns Wharf to this year's theme, Hollywood Holidays. Before the boat parade — at 3 p.m. — families can visit Santa's Village on the city pier at the Santa Barbara Harbor. Visitors can enjoy 10 tons of snow, and the first 400 children will receive goody bags. Following the boat parade, an award party where judges deem best decorated boats will take place at the Maritime Museum. All event activities are free. In the North County, parades, tree-lighting ceremonies and more are planned to celebrate the season. The Lompoc Valley Children’s Christmas Season Parade with the theme of “Winter Wonderland” will kick off at 6 p.m. Friday. The route starts at the corner of Pine and H streets, proceeds south on H, then turns right onto Ocean Avenue and concludes at I Street. After the parade refreshments will be served at Centennial Square, where organizers will announce parade winners and light a community Christmas tree. In Solvang, Julefest involves a multi-week, multi-event celebration including a parade starting at 11 a.m. Saturday. The Vikings of Solvang, a charitable organization, and its members will ride in a place of honor as grand marshals. The night before the parade, the Vikings will be introduced at the the community tree lighting event in Solvang Park starting at 5 p.m. Friday, and will flip the switch to light the 20-foot LED “drought-tolerant” Julefest tree. The parade, with the theme of “A Danish Tradition,” travels through the village. In Santa Maria, the annual Christmas Parade of Lights will start at 5:20 p.m. Saturday, traveling south on Broadway between Stowell Road and Main Street. In keeping with its theme “The Joy of Giving,” the parade will serve as a canned food drive for the Salvation Army with spectators and participants asked to bring nonperishable food. The parade is organized by the Rotary Clubs of Santa Maria and Nipomo. Los Olivos will host an Old-Fashioned Christmas from 1 to 8 p.m. Saturday. A full schedule of events is available here, and will include lighting the Christmas tree at flagpole at 6 p.m.
Buellton’s Winter Fest features a day full of holiday celebrations on Sunday, letting children eat Breakfast with Santa from 9 a.m. to 11 a.m. at the Buellton Rec Center. General admission is $15 while children 9 and older will be admitted for $5 and those 8 and younger can enter for free. From 4 to 6 p.m., Avenue of Flags will host musical performances, 20 tons of snow and assorted vendors with wine/beer and food for sale. The lighted parade, or mobile neighborhood block party, will start at 6 p.m. and including singing Christmas carols ending at the Christmas tree-lighting ceremony at 7 p.m. on the Avenue of Flags at First Street. The Old Town Orcutt Christmas Parade will mark its 56th edition when it kicks off at noon Dec. 9, rain or shine. The parade will start at Broadway and Pinal Avenue in Old Town Orcutt, before traveling several blocks east on Clark Avenue. In conjunction with the parade, there will be a food drive benefitting the FoodBank of Santa Barbara County. Prior to the parade, a Christmas Festival is planned with food and arts and crafts booths from 4 to 6 p.m. at the Veterans Memorial parking lot in downtown Guadalupe.